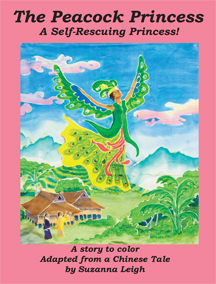 The Peacock Princess, a story to color, is at the printers! I expect copies to arrive in time for strawberry festival, July 17-19. Jane Valencia and I are doing a booth together, "DragonRider Press and Forest Halls". If you are on Vashon Island July 8-19, look for us in Booth #8, on the west side of Vashon Hiway, near the bank and next to All Things Rich. I'm working on a backdrop for the booth, painting on silk, Something cool and inviting that represents both of us. I know what to do. I have the drawings done and all my materials together. But now the doing of it--suddenly I am paralyzed. It's work I love and do well, and suddenly I don't want to do it! It's that fear that hits when ever I start a new project. It's not that I fear anything in particular. If fact, mostly I don't even recognize it as fear! It disguises itself as Inertia, or Tiredness, or Procrastination, or Rebellion, or The Floor Needs Moping and the Dishes Need Doing. Sometimes, when art isn't involved, it just means "putting on my boots and picking up a shovel", like when a major house repair job needs doing. Just making a beginning starts the process and soon the next step becomes apparent, then the next. Art making seems to require something different. I think sometimes it's my left brain unwilling to give up control to my right brain, my art making brain. Sometimes it works to tell my left brain, "It's only for awhile. You can get back in the driver's seat after awhile," and that works. Or writing about the process in my journal. So now I'm writing to you, hoping that will melt away the block and I can get to work on a lovely backdrop for our booth at Strawberry Festival!